Mass spectrometry (MS) is an analytical technique to measure the mass of atoms or molecules of a gas e.g. evaporated from a sample material which has been heated up. The spectra are used to determine the elemental or isotopic signature of a sample, the masses of particles and of molecules, and to elucidate the chemical structures of molecules, such as peptides and other chemical compounds. Mass spectrometry works by ionizing chemical compounds to generate charged molecules or molecule fragments and measuring their mass-to-charge ratios. Both manufacturers Linseis and Pfeiffer are some of the leading companies in their specialized fields. 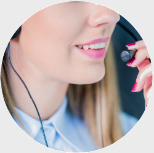 This cooperation guarantees outstanding performance for the combined system. Transfer line is temperature controlled up to a maximum of 250°C. Fast response time through short transfer line. MS detector with very high sensitivity and with different mass numbers available. Determination of blenders and additives. Analysis of rubbers and plastics. 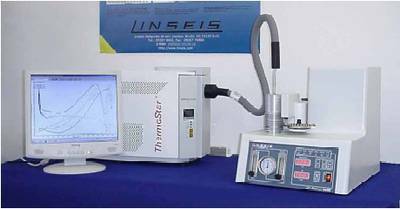 Linseis Research balance (different models) with TG or simultaneous TG/DSC or TG/DTA measurement. Simultaneous balance with (0.1/0.5/1µg) resolution and 25gram max. sample weight. 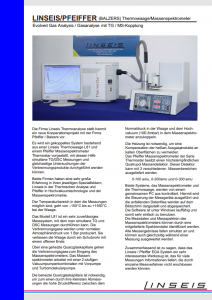 Specific heat measurements (Cp) possible. 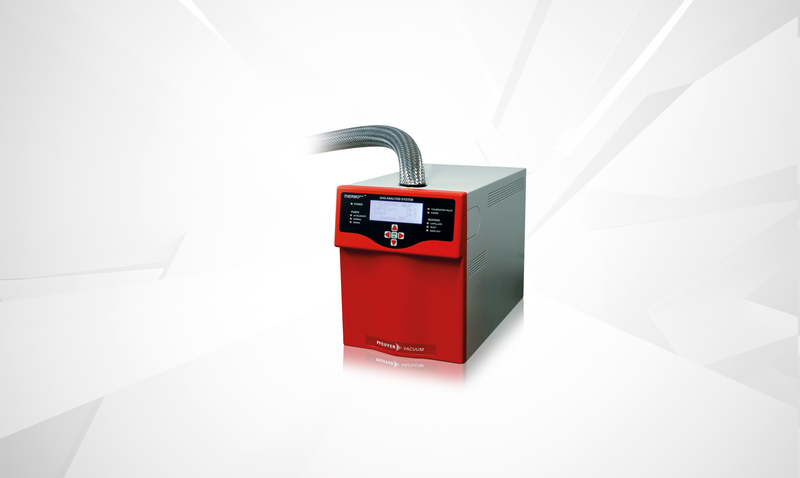 Highest precision Quattropol-MS from world leader in MS Technology. MS with very compact dimensions. Very easily exchangeable quartz capillary. Three separate heating zones, at capillary, at TG protection tube and at MS vacuum inlet. Carrier gas with wide range of flow rates. Especially developed Al2O3 “sniffer-nose”, to extract the out gases. Combined results of TG and MS available in one evaluation sheet. 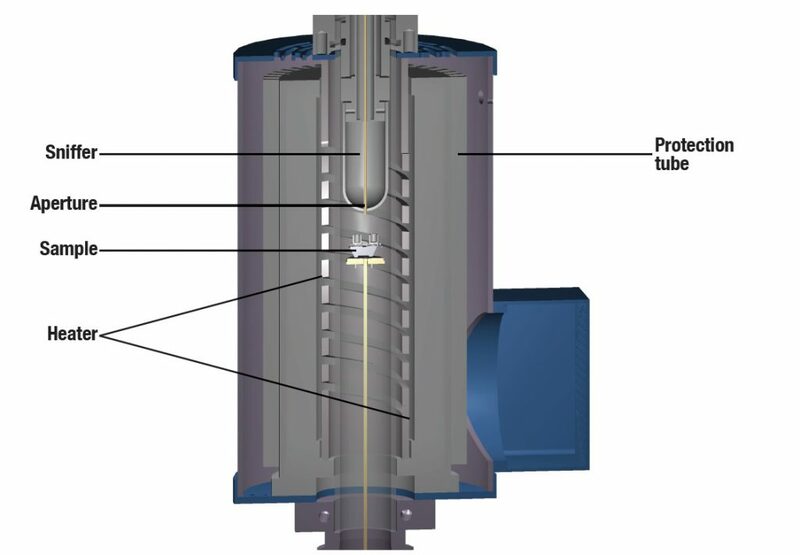 The Pulse-Analysis injects a exactly predetermined amount of liquid or gas into the Thermobalance (TGA) or Simultaneous Thermal Analyzer (STA). 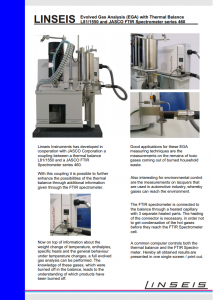 This enhances the measurement possibilities significantly: the MS or FTIR can now be calibrated. 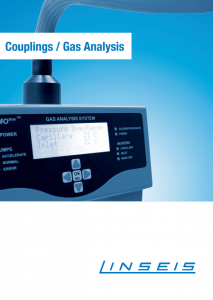 Out gassings can be quantified precisely with this method. Due to the limitation of the input pressure of the MS, the sample gas must be taken after the pressure controller (at ambient pressure). So, only substances which can pass through the cold trap can be analyzed. The outgassings of the sample are passed to the QMS-analyzer directly, using a very small aperture. This small aperture (or orifice) reduces the pressure inside the pressure vessel to the input pressure allowed for the QMS. Since this aperture is inside the hot zone of the furnace, condensation of the out gassings can’t take place. Since between the aperture and the ion-source of the QMS a vacuum of app. 1e-5mbar exists, condensation there is impossible also. The sniffer is placed directly above the sample. This is possible because of the the sniffer material, which can resist the temperatures in the hot furnace area. The combination of thermal analysis with mass spectroscopy is a very powerful method to identify and quantify the components of the raw material and it is also a tool for the simulation of the manufacturing process of building materials. The components of cement raw material are: mixture of ceramic components (gypsum, calcium carbonate, etc.) and also organic components. 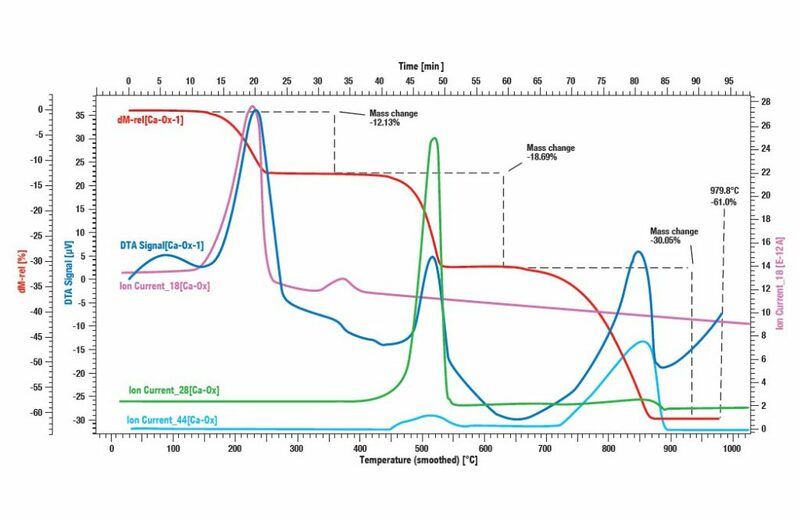 The picture shows the simultaneous thermogravimetry (TG) combined with differential scanning calorimetry (DSC) and mass spectroscopy (MS). The mass spectrometry allows the identification of the evolved gases from the material. 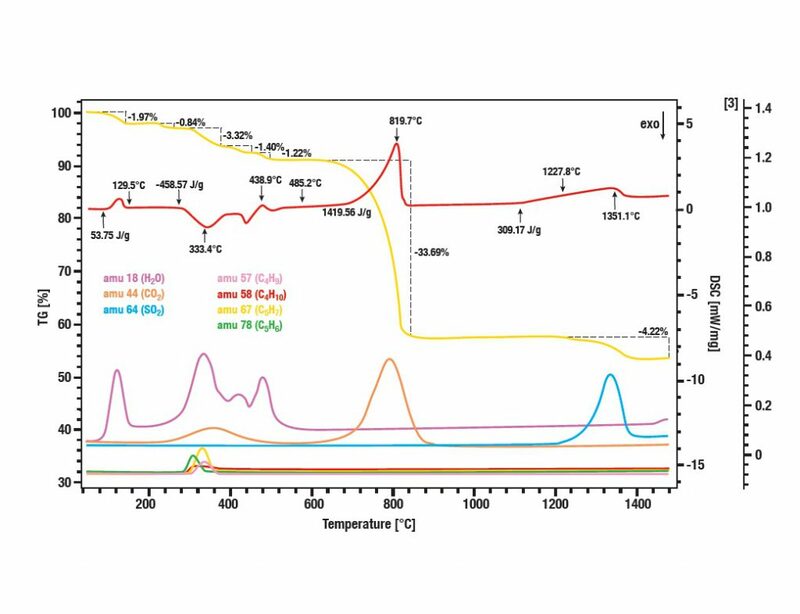 Mass spectrometry shows peaks from H2O at low temperatures most probably from gypsum. 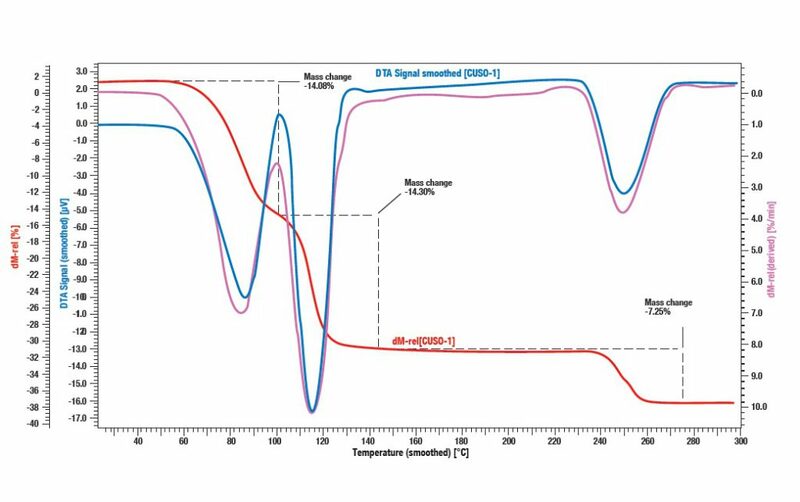 The DSC peaks and the signal from mass spectrometer between ~300°C – 400°C indicates the decomposition of organic components. The peak of CO2 at ~800°C indicates the decomposition of CaCO3. At ~1300°C CaSO4 decompose (SO2 – Peak).